Ratchet & Clank has caused quite the stir since it debuted last month on PlayStation 4. Releasing to widespread critical acclaim, its success seemed to catch the gaming community somewhat by surprise. Sony, too, apparently underestimated Ratchet & Clank’s popularity; or rather, they underestimated the capacity of a reboot to garner such significant attention. Indeed, Sony’s lack of any substantial marketing campaign in the build up to its release, and the game’s low ball $40 price tag is perhaps testament to that. It seems rather odd that more was not made of its impending release, but it wouldn’t be the first time Sony have underplayed quality exclusive titles, and for that matter misplaced their enthusiasm in others. Just consider the differing fates of Until Dawn and The Order1886. Ironically, Ratchet & Clank is right up there with Uncharted 4 as one of the PlayStation 4’s best titles, despite receiving much less attention from Sony. Developer Insomniac Games have done a wonderful job of rejuvenating the franchise and the game has been so popular that it could be the catalyst for a renaissance of the entire 3D platform genre. It’s hugely exciting and it’s an achievement that shouldn’t be understated, not least because it has certainly gone some way in demonstrating to other developers the potential reward of breaking the moulds of convention. 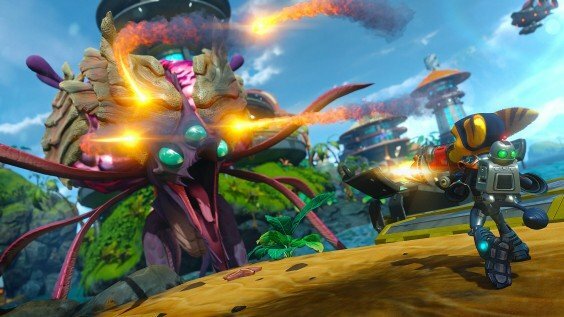 In an industry in which big budget AAA games are becoming increasingly more formulaic, Ratchet & Clank reminds us all that shaking up the status quo is a risk worth taking. What’s particularly impressive about Ratchet & Clank is that while it might effectively be a rehash of what we’ve seen before, it simply doesn’t feel like it at all. Despite being, at its core, a modernized version of the original, Ratchet & Clank manages to feel every part an instant PS4 classic. There aren’t many gimmicks to the way in which delivers its value. Instead, it’s quite simply a very good video game, and at the heart of its success is a title that boasts superb gameplay. Satisfying combat, a surprising amount of strategy in its gunplay and thrilling platforming sequences; Ratchet & Clank is light hearted entertainment at its finest. To top it all off, the game’s quality also extends to both its gorgeous visuals and witty writing. As a total package it is perhaps rivalled only by Uncharted 4, and from a pure gameplay standpoint you would struggle to find a superlative on PS4.